For those of you who are heavy computer users, a high quality keyboard is an important aspect of typing. The high-end Das Keyboard Professional features high quality gold-plated mechanical key switches and a two port USB 2.0 hub. What sets this device apart from all the other keyboards on the market is the way it feels and sounds while typing. 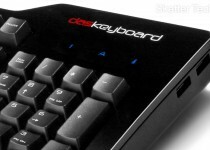 The keyboard responds rapidly to pressure and also emits an audible “clicking” sound from the pressing of a key. The Das is targeted towards everyone from gamers to writers and for those who spend large portion of their day on their computer. The main reason for the existence of this product is the way keys have been designed. The first time you use this keyboard you will immediately love the way it provides tactile feedback with the press of each key. I personally found the “clicking” sounds that comes with the press of each key quite irritating in the beginning, but came to like it after some time. It might be a problem in some situations, say if you are working around others or if someone in the room is asleep. If you don’t like the idea your keyboard sounding like a type writer, this is not the right keyboard for you. I can guaranty that most people who use it will find it extremely comfortable for brief or extended periods of use. 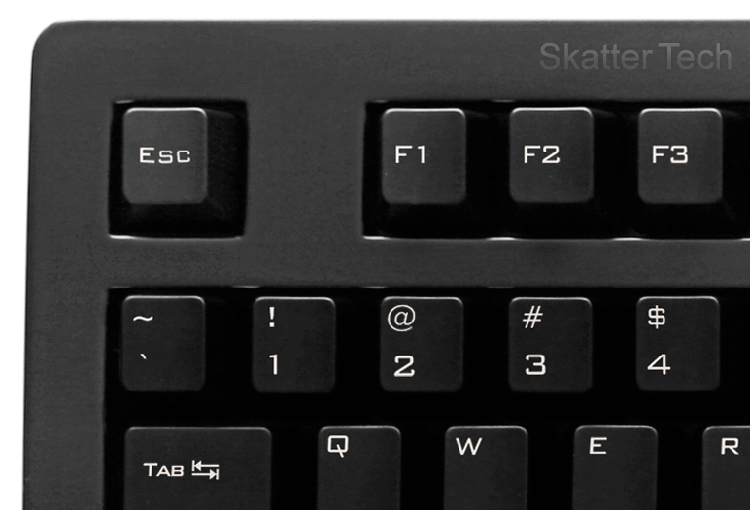 For those of you who are gamers, you might be interested in the Das Keyboard’s “n-key” rollover feature which accepts up to 12 simultaneous key presses without any jamming. I put this feature to the test by pressing all the keys in the “QWERTY” row down at once. It did indeed succeed to input them all into my text editor instantly. My $10 Logitech keyboard on the other hand constantly failed to accept over four simultaneous key presses while my laptop keyboard would jam after six. So not only does the keyboard feel and sound good, but the designers kept technology in mind making it a very accurate keyboard. As for the visual aspect, the keyboard is pretty darn minimalistic. The Keyboard has the standard QWERTY layout and a numeric keypad with a total of 105 keys. There are no special programmable buttons or other features of any sort. 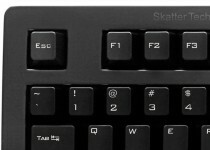 There are blue LEDs to indicate the status of Caps Lock, Scr Lk, and Num Lock. The Das Professional is actually one of the heaviest keyboards I have seen to date, which may be a good thing for desktop users since it will remain steady on your desk. There are also two pop-up feet on the bottom to create an angle for typing if desired. 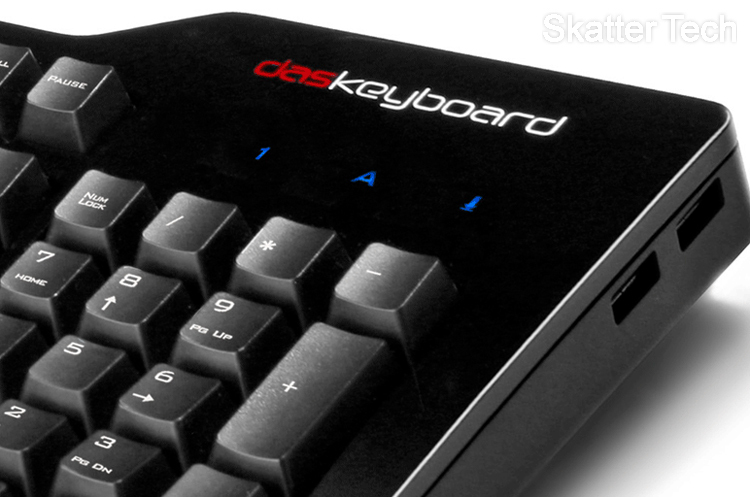 The Das Keyboard Professional is compatible with Linux, Mac OS, and Windows. All you need is a functional USB or a PS/2 (adapter not included) port to plug it into. The Keyboard has a high quality 6.6 foot long cable which is useful for plugging into machines far away. The two USB 2.0 ports can be used to connect flash drives, mice, or even charge gadgets. If the overall power demand is too high, the hardware automatically shuts down one of the ports to prevent full failure. Although I found it interesting to see a USB hub on such a simply designed keyboard it is none the less a neat aspect. 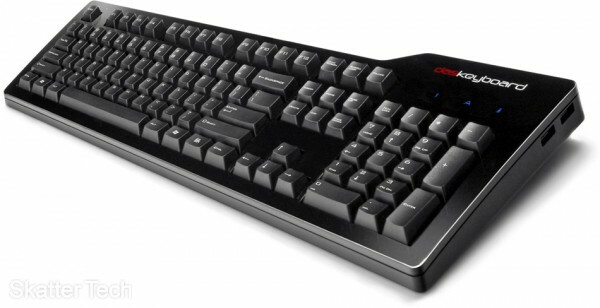 The Das Keyboard Professional is now available for purchase for a retail price of $129 on the company’s website. This device is definitely much pricier than most keyboards on the market. There are plenty of decent keyboards available for a much more affordable price. However if you are looking for something which truly feels comfortable for long durations of typing and is extremely accurate, this is the way to go. I have gone through many keyboards over the years and this is probably the most comfortable one I have used to date. If you know of or use a more affordable or better keyboard, please point it out. I don’t believe any WiFi Keyboards are on the market, I think you may mean Bluetooth Keyboards. There are a few available. For example the wireless Keyboard included with the Apple iMac connects via Bluetooth! You just DON’T know what’s a Das Keyboard. check out the stuff logitech wireless keyboards. they are great i’ve got the mx550 it i a bit expensive but i like it a lot and no problems so far. and regarding the clicks on this thing, does it sound like a typer writer? how could some one possibly stand that sounds? i always look for more quite stuff lol, kinda funny. Das keyboard isn’t for noobs, it’s for touch typing enthusiasts and geeks. I comlpetely agree with ssj4Gogeta and shad. The idea behind the das keyboard is the typing feel, not the extra gimmicky things it doesn’t need, such as wireless (which can be a single point failure when it doesn’t work properly), media buttons, LCD screens and other “innovations” that add no value to the typing experience. The das is also not designed for incompetent individuals (specifically, those who lack the ability to spell correctly or convey basic English grammar skills). I’m typing all of this, by the way, on an IBM Model M, which is even louder and clickier than the das, not to mention much heavier. A particularly good use for a Model M (If you aren’t old enough to know what these look like, visit clickykeyboards.com) besides the wonderful typing experience, is to use it as a baseball bat on the craniums of certain imbeciles such as those above who can’t “possibly stand that sounds” or think the das is the “ugliestt” keyboard. (Hint: the das is not ugly; it is just you). – The Model M bigot who dislikes the two ignorant schmucks who can’t spell, lack technical knowledge (a ‘wi-fi keyboard?’), yet attempt to compare low quality Logitech rubber dome switch keyboards to high quality mechanical keyboards. comlpetely. sertainly. I just typered on a typer writer. Then I look for more quite stuff. ecksellent quite stuff that is quiet noisily. quite stuf that not to ugliestt. lol oldfart–hanks for putting those two dumbasses in their places — I laughed like hell reading that! Ha ha, I have the das keyboard, an IBM Model M, p/n 1391401, and a Unicomp Customizer 101, all three just awesome keyboards. Logitech does pretty darn good with mice, remotes and joysticks, but comparing their keyboards to the das keyboard is like comparing a Pontiac Fiero (remember those??) to a Ferrari 360 MOdena. No comparison. I must agree with the old fart — the das keyboard is certainly not ugly. The Logitech MX550 sure is though.